This is the second post from our trip to Giant’s Castle nature reserve in the central Drakensberg in South Africa. We spent a couple of days in the well-known Giant’s Castle vulture hide. This hide is known for sightings of Bearded vultures, Jackal buzzards, White-necked ravens and Red-winged starlings. It is less known for its falcons. 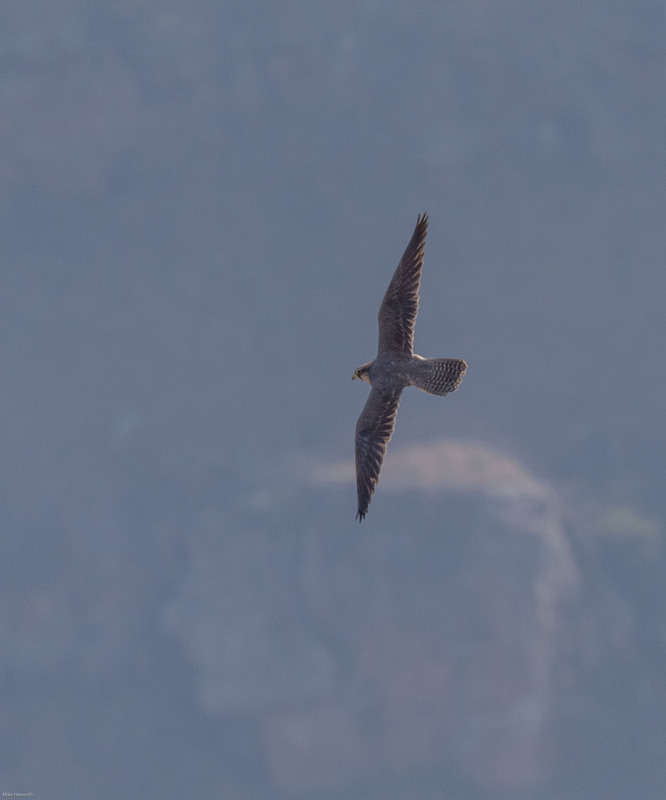 One of the raptors which visited once a day, each day we were there, to stir everything up was a lone Lanner Falcon. “You come out of nowhere. Like a teardrop falling at lightning speed. We are only starting to appreciate your unique physicality as an apex predator. I have a special place for falcons in my wildlife psyche. This was borne out of experiences watching friends like long-standing “shamwari”, a shona word for friend, Adrian Lombard at our senior school, Falcon College in Zimbabwe. Adrian would regularly, late in the afternoons, once sports activities had finished, take his Lanner out to fly over the sports fields. Two of the key extra mural activities at this bush school where going out into the bush (with a pack of sandwiches and a snake bite kit) on Sundays and falconry which was usually practiced once sports activities had finished and the playing fields were quiet. 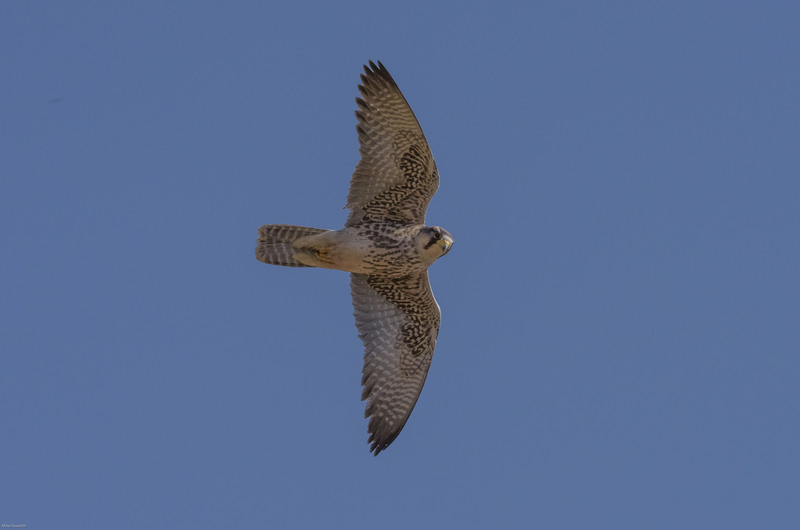 The birds used by the falconers where Lanner falcons, Tawny eagles, Black-shouldered kites and Sparrowhawks. I have retained a special place for Lanner falcons having watched them perform above the playing fields at school. In the afternoon, Adrian would cast the falcon off his glove and it would fly high above the field. After a few minutes, Adrian would blow a whistle and start to swing his lure at the end of a light rope. The falcon would see the lure and stoop down from a great height and level out on the far side of the field below the rugby posts and rocket across the field focused on the lure. Adrian would let the rotating lure go and it would swing high into the air. The falcon would watch the circulating lure while powering across the playing field at phenomenal speed and catch the flying lure in its talons. Time and time again, the display was a stunning show of speed, agility and accuracy. When I watched the Lanner stooping onto the ravens in front of the vulture hide, I got the same feeling of awe that I had on the sports field watching Adrian’s falcon flying all those years ago. We put bones out in front of the hide, the object being to feed the Bearded vultures. It seldom worked that way. The White-necked ravens patrol the hide area. As soon as food was put down they arrive in numbers, up to ten to 15 ravens at a time. These birds seem to be the “hyaenas of the castle”. They love the fat on the bones. As the morning wears on, once the ravens are well sated and they just hang around the hide making sure that no other birds get to feed on the fat. Between 12h00 and 14h00, just when everything was becoming quite sleepy, out of blue, a Lanner would come stooping onto the ravens grouped together. Lanner hunting often takes place where prey congregates, such as at waterholes or colonial nesting or feeding sites. Lanners are orders of magnitude faster and more maneuverable than the ravens. Once the Lanner streaked through the flock of ravens, they would scatter only long after the Lanner had flown through. Repeatedly, the Lanner would stoop onto the ravens. We never saw it hit one but I am sure the Lanner does on occasion. The Lanner falcon feeds mainly on small to medium-sized birds, ranging from larks up to the size of ducks and guineafowl. Ravens are right on the menu. The Lanner stirred up the ravens and they remained very edgy for the next hour or so after the Lanner’s visit. It was thrilling so see this avian predator come in at such speed and liven up the hide’s stage. Falcons are birds of prey in the genus Falco, which includes about 40 species. All these birds kill with their beaks, using a “tooth” on the side of their beaks—unlike the hawks, eagles, and other birds of prey in the Accipitridae, which use mainly their feet. Falcons are roughly divisible into three groups. 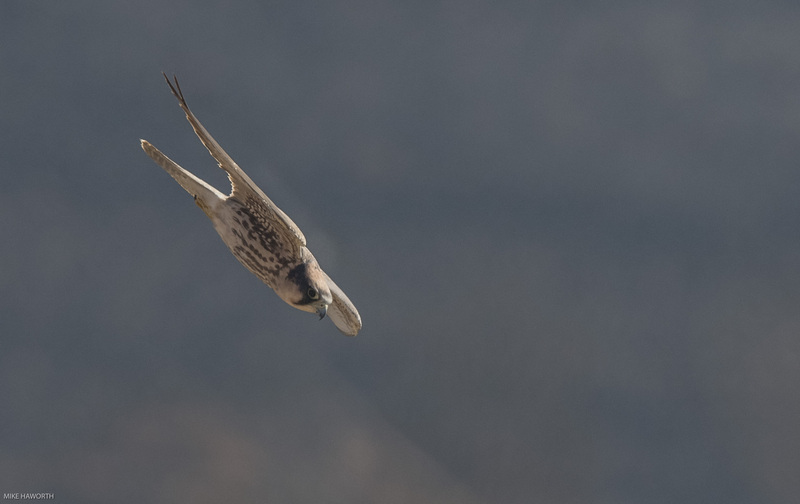 The first contains the kestrels, the second slightly larger species, the hobbies and relatives. These birds are characterised by considerable amounts of dark slate-grey in their plumage; their malar areas are nearly always black. They feed mainly on smaller birds The third group is the Peregrine falcon and its relatives, these powerful birds also have a black malar area, and a black cap, The Lanner falcon is a usually a raptor suited to open country and savanna. 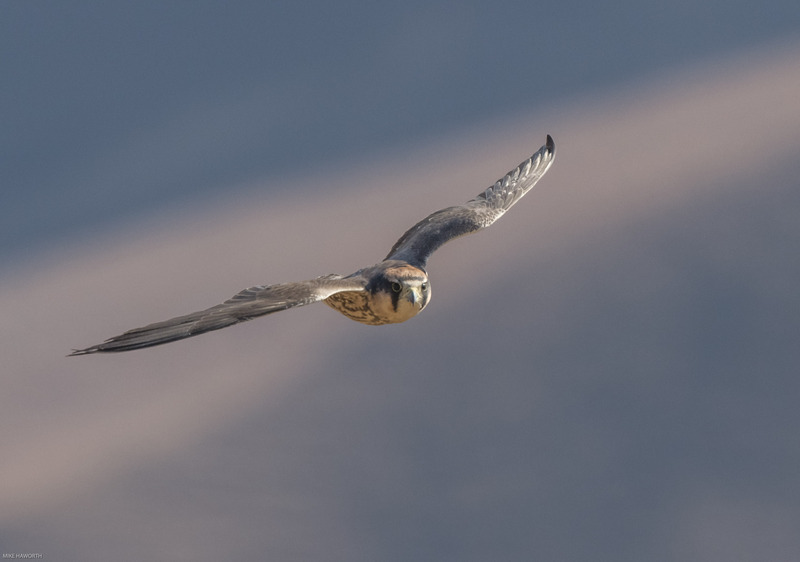 It hunts by horizontal pursuit, rather than the Peregrine falcon’s stoop from a height, and takes mainly bird prey in flight. Lanners have a yellow eye ring, a yellow cere and yellow feet. It has the diagnostic “hangman hood” with cap and moustachial strip. It has pinkish buff underparts which distinguish it from other falcons and their chest stripes fade as they mature. 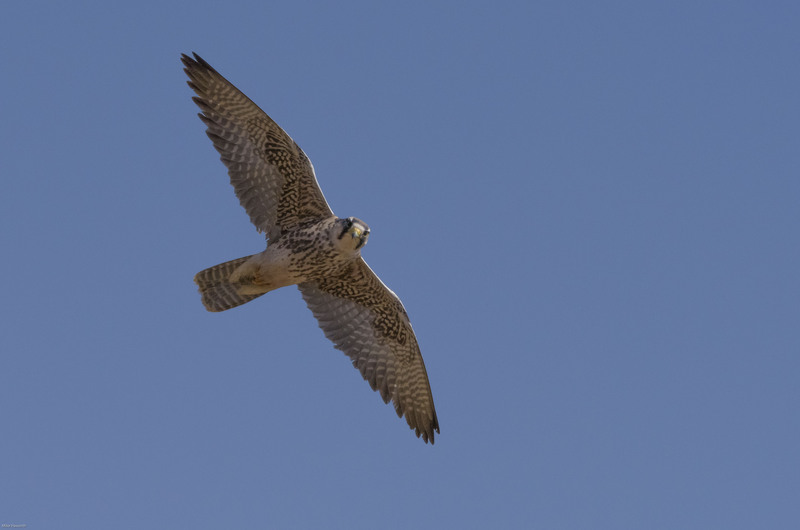 The female Lanner falcon is usually larger, darker and more patterned than the male. A Peregrine is smaller than a Lanner and darker in colouring. Aside from the characteristic notched beaks, falcons have small bony protuberances in their nostrils to baffle airflow in stoops, allowing them to breathe at high speeds. The presence of bony tubercles in the falcon’s nose act to slow down the airflow, increasing the air pressure, which eases breathing. As planes got faster and faster, the engines started choking out at a certain speed. It seems that the air, instead of going into the cowl of the engine, encountered a wall of still air in the engine cowl and so split and went around the engine. Puzzled, the researchers wondered how the falcons could still breathe at such incredible speeds. Looking at the falcon’s nostrils, they found the answer. In the opening of the nostril is a small cone that protrudes slightly. Fashioning a similar cone in the opening of the jet engine, they discovered that the air could pass into the engine even at great speed. Once again a human invention is preceded by an animal adaptation. 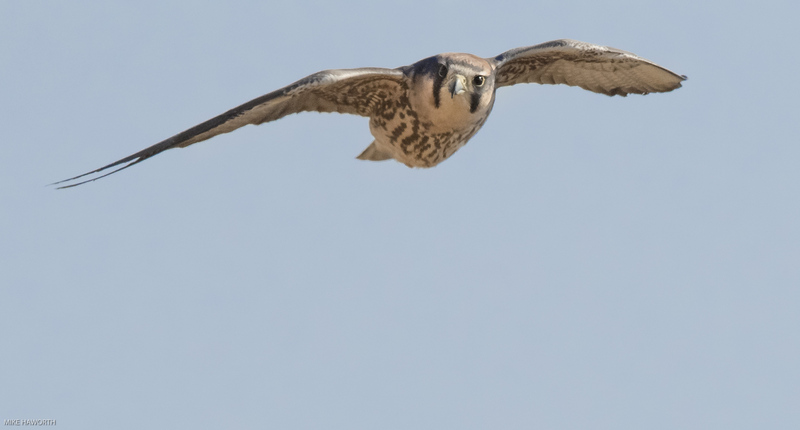 The air pressure from a high-speed dive could possibly damage a bird’s lungs, but small bony tubercles in a falcon’s nostrils guide the shock waves of the air entering the nostrils, enabling the bird to breathe more easily while diving by reducing the air pressure differential. When in attack mode, the falcon’s pulse rate can reach 600-900 beats per minute, to fuel its body with oxygen. The falcon’s long narrow wings give this raptor more stability. Metaphorically it is like a tightrope walker holding a long pole across their body as they walk along the rope. The extra ‘arm’ length helps to balance the body by adding more mass to either side of it. The trade-off is manoeuvrability. The falcon’s long narrow wings have less end edges. Different air pressures meet at the edges; the less edges, the less turbulence. 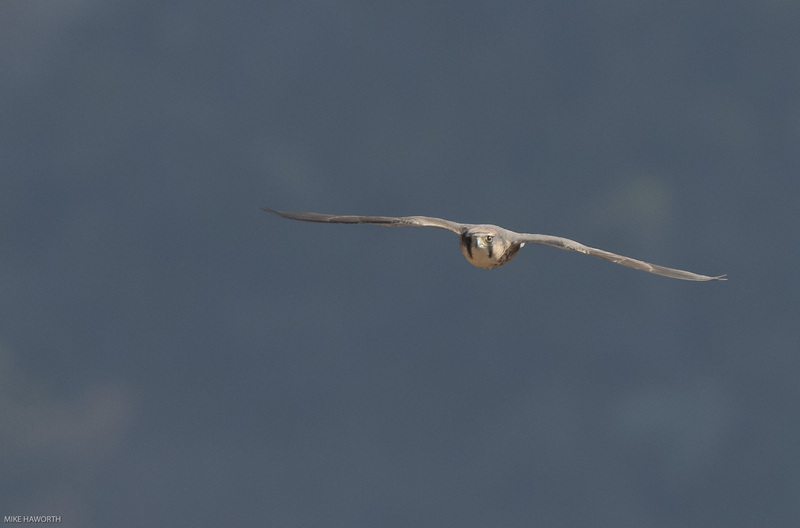 The falcon’s more stable wing dynamic than shorter wider wings creates less drag. The feathers on the falcon’s back vibrate when the bird is completing a dive and has overshot the optimum angle of attack. This is the point at which the falcon is in danger of spinning out of control. The vibrations serve as a warning signal for the falcon to adjust its flight path. 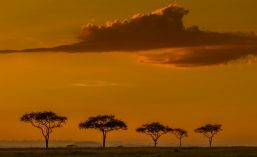 (www.evolving-science.com). There are ten primary feathers on each wing. Falcons only have that soaring slot on the primary feather closest to the tip of their wing. All of their other primaries are smooth The tail feathers or rectrices, are also critical to the falcon’s flight performance. Rectrices (from the Latin for “helmsman”), help the bird to brake and steer in flight. These feathers lie in a single horizontal row on the rear margin of the anatomic tail. The wing’s primaries are connected to the manus (equivalent of the bird’s “hand”). These are the longest and narrowest of the remiges or flight feathers, and they can be individually rotated. The secondaries are connected to the ulna or forearm bone. The tertials arise in the brachial region or upper arm and are not considered true flight feathers as they are not supported by attachment to the corresponding bone, in this case the humerus. 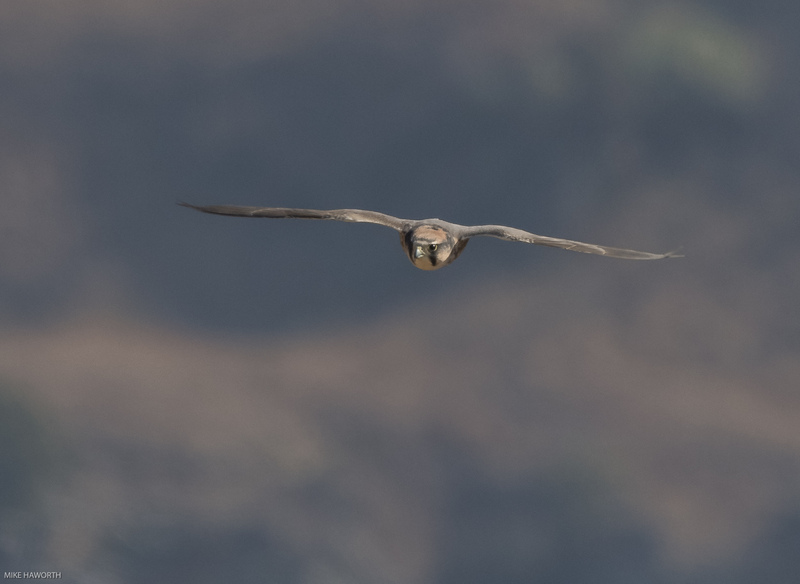 Flat, rather high-aspect-ratio wings lack slots, and with feathers at the base that streamline the trailing edge in with the body, are found in falcons, swallows, plovers, and other specialists in high-speed flight. The falcon relies on its wing shape and speed to catch other birds and literally grab them out of the sky. 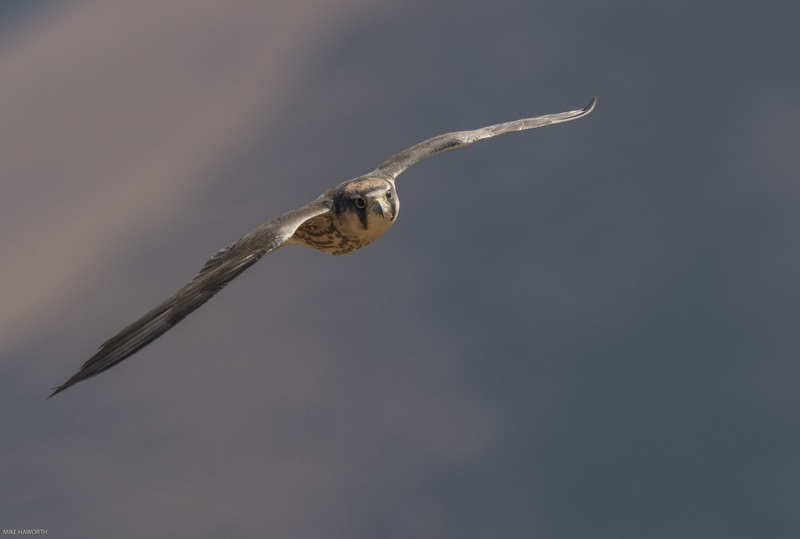 For this raptor, a narrow, pointed wing is perfect – drag is kept to a minimum and the swept-back wing design allows them to dive at high speeds. Hawks, falcons and eagles deviate from each other it terms of the morphology of their respective flight appendages. Falcons have long tapered wings and short tails which lend to their amazing aerial speed and agility. Eagles have very broad wings that are designed for soaring and short tails that aid in maneuverability. Eagles are the intermediate form between falcons and hawks. Hawks have broad wings and long tails which provide a very stable platform for flight. What a wonderful school experience you have recounted – this is a very informative post.